Dutch artist Petrus van der Velden arrived in Christchurch in June 1890 as an experienced 53-year-old painter. In January and February 1891 he spent six weeks at Ōtira in the Southern Alps and became captivated by the landscape. 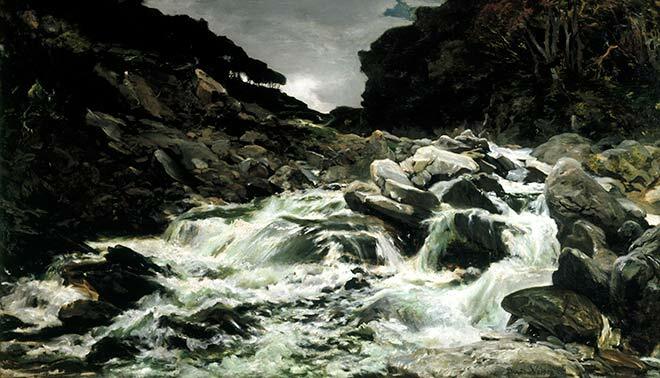 This was the first of a number of oil paintings he made of the Ōtira River on a stormy day. It was exhibited to considerable acclaim in art society exhibitions in Auckland, Christchurch and Dunedin, where it was bought for the art gallery. Van der Velden saw the moody drama of the Ōtira Gorge on dark rainy days as expressive of the presence of God. He returned to paint the scene several times before leaving for Australia in 1898, and again after returning to New Zealand in 1904, where he lived until his death in 1913.